Spencer Industries employees participated in "The Biggest Loser" contest that started Jan. 6th, 2010. We had 23 Employees committed to weighing in each week for twelve weeks. Employees were constantly watching their opponents, and seeked healthy advise on how they were losing weight. Like any other competition it came down to the wire between two employees. 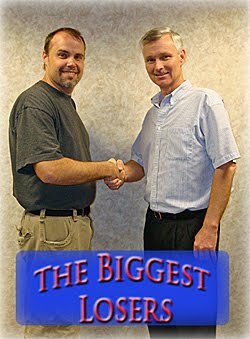 Between the both employees they have lost a total of 104.5 lbs. The winner was Randy Rhoades, and Kevin Martin falling only 4 lbs shy of winning. There has been talk about starting a "Maintain Program" for those who participated in the contest to keep those pounds off.